In today’s Wall Street Journal I review a New Jersey show, Two River Theater Company’s revival of Camelot. Here’s an excerpt. Does the old-fashioned Broadway musical have a future? If so, it may well be found in the scaled-down revivals of classic musicals that are currently being presented by smart theater companies across America. To see a show like Amanda Dehnert’s school-of-Brecht 2013 Oregon Shakespeare Festival version of “My Fair Lady,” or the radically reconceived single-set “Porgy and Bess” that Charles Newell directed at Chicago’s Court Theatre in 2011, is to realize that given sufficient imagination, it’s possible to do complete artistic justice to a golden-age musical in a small house without busting the budget. 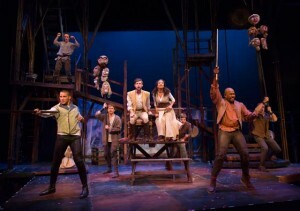 The latest example is David Lee’s Two River Theater Company production of “Camelot.” Not only is it the best “Camelot” I’ve seen, hands down, but Mr. Lee has succeeded in fixing the inherent flaws of a musical that, for all its popularity, has never quite worked. The problem with “Camelot,” the Alan Jay Lerner-Frederick Loewe musical version of “The Once and Future King,” T.H. White’s 1958 novel about the legend of King Arthur, is that it’s far too long and elaborate for its own good. Having turned the novel into a big theatrical machine with a cast of 30 that ran for four and a half hours in previews, the two men then hacked an hour and a half out of “Camelot,” and kept chipping away after it opened in 1960. They ended up with a hit. But “Camelot” has never been successfully revived on Broadway, and I’ve always wondered whether it might in fact be an intimate music drama trapped inside an overblown stage spectacular. If you’re going to strip a show like “Camelot” down to the bone, you’d better have a cast that’s strong enough to make an impression without benefit of the lavish scenic trimmings that audiences expect. Ms. Coleman has got what it takes. It’s been a long time since I’ve seen a young musical-theater performer with the star quality that she radiates…. Is it real, or is it color? 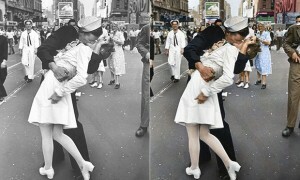 In today’s Wall Street Journal “Sightings” column, I consider the vogue of colorized historical photographs. Here’s an excerpt. Once upon a time—a quarter-century ago, to be exact—colorization became a dirty word almost overnight. Ted Turner had been marketing watery-looking “color” versions of popular black-and-white movies, an enterprise that Gene Siskel and Roger Ebert labeled “Hollywood’s new vandalism.” Ginger Rogers agreed, declaring that it “feels terrible…to see yourself painted up like a birthday cake on the television screen.” Then, in 1989, Mr. Turner announced plans to colorize “Citizen Kane,” Orson Welles’ masterpiece, and Hollywood’s patience ran out. Leading directors like John Huston and Martin Scorsese declared their opposition to colorization, and before long, Turner Entertainment abandoned the practice. To this day, the marketing of colorized prints of “Kane” and other classic films of the past is still widely regarded as unacceptable, even unthinkable. Historical photographs, on the other hand, have come to be seen as fair game. Now that digital technology has advanced to the point where it is possible to add convincing-looking color to photos of the 19th and early 20th centuries, the Internet is awash in electronically tinted portraits of everybody from Anne Frank to Abraham Lincoln…. That said, Ms. Dullaway’s colorized photos, as she hastens to admit, are not the real thing. They are, rather, immensely sophisticated recreations—falsifications, if you like—of the past. This was brought home to me when I noticed that colorized historical photographs by Ms. Dullaway and other retouchers were starting to circulate on the web via Twitter. Some are clearly labeled, but most are not, and my guess is that most people, seeing these images for the first time, take it for granted that they are not digital recreations but original color photos. Does that matter? Or is it old-fogeyism to grumble about a technology that really does bring history to more obviously vivid life? I confess to being both attracted and alarmed by the communicative power of these photos….